Starting my sophomore year, I’ve written a blog post every year on the Day of Silence. While the rest of the nation participated in Day of Silence on Friday, we were busy celebrating our seniors in Lavender Graduation (2012, what’s up!?). As a result, the Blue Devils United Executive Board decided that here at Duke, we’d observe DOS tomorrow. 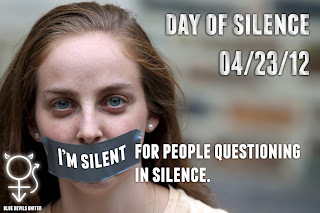 Tomorrow, I’m silent for those who are questioning in silence. After all, I was one of them for far too long. So what kept me from talking about it? At the time that I came out as questioning on the blog, I wrote that there were “approximately 12318023 barriers along the way.” Here’s four of them. And, while I can’t say that these are the barriers that every person who is questioning faces, I also don’t believe that they are entirely unique unto me. 1. I didn’t want to be “Just another gay LGBTQ Rights Activist” It might be hard for some people to believe, but I’m not an LGBTQ rights activist because of my own sexuality. My activism has and always will stem from the “ally” part of me—the part of me that believes that all people deserve respect, equality, dignity, and safety. It’s the part of me that embraces MLK’s quote, “Our lives begin to end the day we become silent about things that matter,” and out retired NBA player John Amechi’s quote, "Why speak, why act, why exist if not to change the world?" I didn’t want to be “just another gay LGBTQ rights activist,” because I’m not. I might be gay or bi or something other than straight. And I’m definitely an activist. But those identities aren’t connected for me. To this day, when I advocate to vote against Amendment 1, it’s not because someday I might want to marry a woman. It’s because I believe all people deserve the right to the legal protections and benefits that come with marriage. As people in this community understand all too well, it’s not fun being taken for something you’re not. Coming out as questioning jeopardized people understanding my motives for being an activist. 2. I didn’t want to be “Just Another Gay Female Athlete/Women’s Sports Fan” What I learned from this is that stereotypes hurt people. Both people who are and aren’t a stereotype feel the need to continually prove that they’re not. Specifically, people who fit a stereotype want to be seen as an individual—not as an archetype. The female athlete/women’s sports fan stereotype, especially, kept me from embracing who I might be. I didn’t want people to think I was just another gay female athlete/women’s sports fan, because once again, those things are obviously unrelated for me. And because I’m so much more. I was afraid people wouldn’t get that. So I denied that I was questioning—to myself and others. 3. I didn’t want to talk about it until I had answers/a girlfriend/etc That’s pretty simple. Explaining what you might be and what you might not be—well, it’s confusing and complicated and most people, even if they are embracing/affirming/etc, don’t get it. I didn’t want to “come out” if I was just going to decide that I was actually straight. And if I did decide I was gay/bi/queer, I didn’t want to come out until I had a significant other, because, it seemed pretty irrelevant. 4. No One Else Talked About Questioning Even in the LGBT Center, where people are eccentric and own their quirks…nobody once talked about questioning (in my presence). Everybody seemed to know where they stood—seemed to have this story that they popped out of the womb gay and have known since then. I felt like I was the only one to ever struggle with this, and I didn’t even have words for it. Obviously, I’ve learned to put those woes aside. People might think that I’m an activist because I’m questioning and they might think I’m just a stereotypical female athlete and women’s sports fan, but they’d be wrong on both accounts. There isn’t much I can do about it, though, and it isn’t worth my time or energy to worry. It sure isn’t worth my energy to be ashamed of who I am because of their narrow views. I’ve also since learned to live with and embrace questioning. Anybody who’s ever taken a class with me (dating back to kindergarten) knows that questions are what I do best. It seems that this is just another area of my life where that’s true. It probably won't surprise people reading this who know me that patience isn’t my strength. In typical Risa fashion, I got tired of waiting to have to talk about my sexuality. Now, I’m not sure I’ll ever have answers—and I’m finally okay with that. Lastly, I learned that if I want people to talk about questioning, I’ve got to be the one to talk about it. Nobody can share my story if I don’t. I didn’t have the role models I wished I would have had—but I can be a mentor, an ear, a support system for someone else. As I see it, I have an accepting family and community, and so it’s my responsibility to help in any small way I can. I want to empower others to share their stories of uncertainty and coming into their own. On the Day of Silence, our collective silence is loud. But in everyday life, the silence around questioning is desperately lonely.